As I am writing these words I find myself at the threshold of the season of Lent, the 40 days of preparation for Easter. 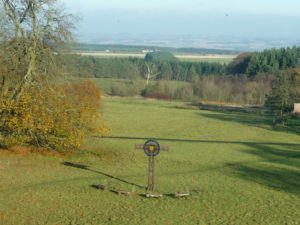 With our retreat theme ‘seeds of hope’ in mind I am reminded of the Cross of Hope that was erected in the grounds of Minsteracres in 2009. 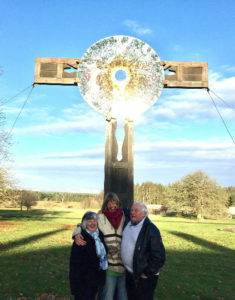 Lya Vollering’s contemporary expression of the paschal mystery highlights the cross as the symbol of suffering and death, but it also shows the light of the resurrection through the circle of glass. This cross can be seen as an expression of the ultimate hope that is treasured in the Christian tradition. The annual celebration of Holy Week highlights Jesus’ passion, death and resurrection. Following him on this journey may open our eyes for the many ways in which this paschal mystery is reflected in the experience of our daily life. The apostle Paul reflects on this journey in his letter to the Philippians and describes it as a process of self-emptying. When we let go of our self-centredness we become more open to God and the world around us. The light of Christ can shine more clearly and we can become more attentive to other people and their needs. I wish you a meaningful and inspiring preparation for Easter and pray that the light of resurrection hope may shine into the world through you.